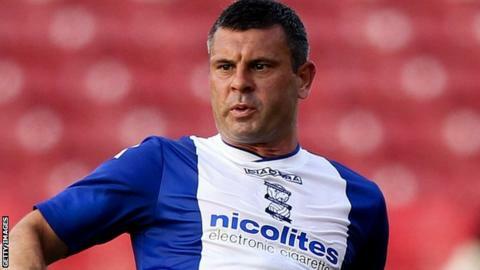 Birmingham captain Paul Robinson says the Championship strugglers' current group of loanees have let them down. Loanee forwards Federico Macheda and Jordan Ibe, midfielders Albert Rusnak and Emyr Huws, and defenders Tom Thorpe and Tyler Blackett have joined in 2014. Robinson said: "The first batch of loan players were different class, buying into the gaffer's ethos and the team and what we expected from each other. "For me, the second lot [2014 signings] have let us down a little bit." Defender Robinson added: "You don't want anyone out there now not giving 100%. The players that go out there have got to wear that shirt with pride." The City skipper is currently serving a three-match suspension after receiving 15 yellow cards this season. The Blues lie 21st in the Championship, above the relegation zone on goal difference. Since the end of the January transfer window, 12 of Birmingham's 21 league goals have been scored by loan players, including nine for striker Macheda, now the club's top league goalscorer this season. "The big clubs send these players out for a reason and that's to get first-team football," 35-year-old Robinson continued. "For me, they've let the gaffer down, they've let us players down, some of them, and they'll just go back to their clubs and get on with it. "That hurts the most because we're football players and we're brought up to love the game. Do these young kids love the game as much? I don't think so." Manchester United forward Jesse Lingard scored six goals in 13 appearances for the Blues while on loan earlier this season. Defensive pairing Dan Burn and Kyle Bartley also impressed as Birmingham enjoyed a 10-match unbeaten run before Burn was recalled by Fulham and Bartley similarly returned to parent club Swansea. Manager Lee Clark added: "Every loan player that's come here has the ability. That's not the point in what we're saying. "All the first batch bought into Birmingham City. In the second batch we've had some who have done that as well but there have been others."